Wow this is awesome, best of luck on the next one. I hope I can someday have something like this as well. your revealed experience about heat transfer most illuminating. Perhaps you should consider , rather than constant flow of water, a pulsed flow to take off peak heat which is most valuable, giving the bugs time to regain their appetite before taking the next harvest of energy. A short period of chill should not kill the bacteria and may indeed foster biodiversity of bacteria. I view living systems which exhibit homeostasis as being in not so much a steady state of simplicity but rather in a cycle of demand,satisfaction and growth. A pulsed system, in my current design, would add complexity, at least in space heating as it would involve some sort of switch/timer/thermostat. I loathe complexity. A simple way to pulse it would be to upgrade the heat exchanger tubing to “potable water” grade plastic and hook it up so that the cold water intake for the existing hot water heater fed THROUGH the pile before going into the water heating tank. This would take the intake water temp from 52 to 120+ and as long as the system cycled frequently enough, would mean the boiler would never run. My thoughts against this are that: much heat from the pile would be wasted, most of the energy lost from a hot water tank is in standing losses which this wouldn’t solve, and finally there would be no way to space heat. That said, this simple, flow through system is how most compost showers work. As long as you space the showers by enough time you will always have hot water, and you don’t need any pumps. Pile size for a system like this could be much smaller – say 2-3 yards- which has some very real advantages. I congratulate you on your efforts thus far and appreciate that you took the time to outline what has and hasn’t worked in your initial trial. It’s sadly rare to see a blogger-experimenter outline what didn’t work, and I know I’m guilty of this myself. So thanks for the progress report and I look forward to the updates. Thanks Kate. Writing about failing is HARD. But in talking with readers this past year, what kept coming up again and again was the Potato Tower debacle. To err is human. Venture Capitalism works on the prospect of funding hundreds of good ideas to find the 1 or 2 that succeed. In my small way I am doing some of that on a micro, ecological scale I guess. I also think it is important not to paint too rosy a picture. Like the new midden has already taken 40 hours of work to build. And I’ve only got 2 yards on the pile; harvesting took a week, chipping another 2 days. I started the summer with the highest of hopes – those first Methane Midden posts were euphoric! But as July neared August it became clear the pile was dying after 4 weeks, and by the end of August it was clear that I wouldn’t make any methane due to potato harvesting, and life in general. It was very difficult to put that into print without feeling like I let everyone down. Now, with some distance, and the rekindled hope of the L’eau Chaude Midden, I was able to bridge the psychological gap. It is important to document this, and failing truly is part of the process. Thanks for your kind words Kate. Thanks for taking the time to look up centimeters and Celsius temperatures. You bet Ria. We have readers on 6 continents now, and only half of one understands my numbers otherwise – sorry it took so long for me to do it! Thanks for taking the time to post all this – the theory and method of what you’re doing, and the results. I’m not planning a methane digester (at this point) but just knowing that someone somewhere has done such a thing and outlined it so clearly is really helpful and inspirational! Here in NZ, some of the trees you talk about are unfamiliar; but because you describe so well the optimal materials, it’d be possible to adapt for what’s here. I don’t know how you find the time to keep us all apprised of what you’re doing, but sure appreciate that you do! Love the enthusiasm and clarity – thank you! Thanks Annie! I had the pleasure to be in NZ last month and I think several of your invasives would work well in something like this – gorse in particular. We also went to Australia and I was extremely impressed with the growth rates of the eucalypts – messmate in particular: 100 meters in under 100 years! Also, bamboo doesn’t grow well here, but it could be another option for your climate. But in general terms, here is my criteria for “industrial” compost feedstocks. What grows like mad *despite* you trying to eradicate it (gorse)? What trees/shrubs put on 3 meters or more a year? What tree/shrubs will coppice well with minimal maintenance? If its a native or non-invasive, then consider planting a grove. If you are inundated with invasives on your land, or a nearby lot, then use that. I see these compost projects as a significant improvement over the traditional burning of cut invasives, as at least you are sequestering carbon and creating a resource (fertile soils). I was going to comment about how inspiring your undaunted passion is on your blog, Rob, but after reading the comments above, I want to add to the conversation about blogging about failure. For me, this connects to the element of our culture that is trained in disposability. “If at first you don’t succeed, drop it and give up” follows closely on the heels of “if you use it and it breaks, throw it out and buy something new.” Most societies in history didn’t have that luxury, hence tinkering, deep thinking, observation, learning, trying, patience, and …. innovation! We desperately need innovation right now, along with wide communication about it. We don’t find much innovation in the mainstream world, and those of us trying to do things differently rely heavily on our fellow bloggers, forum commenators, etc, to help us learn from each others’ experiences all over the world. In my mind, this is crucial to building a new culture from the ground (literally!) up. As a teacher, I’m always trying to communicate to my students that nobody does things perfectly the first time. Even us professional whatevers spend time crafting and redoing until we are satisfied. But they don’t see that part of things; they only see the “perfect” results, and they often assume they are dumb or that they can’t do something if they can’t get it right the first time. The process of working away at something slowly and patiently over time is not something we are exposed to in our daily lives much anymore. So please keep sharing both the successes and the failures. If the doing feels like a compelling, urgent passion, it’s the sharing that will really change the world. Have enjoyed reading posts have just started our own Hotwater Midden on our farm and have just experimented with 50m of 20mm diameter potable water pipe as a coil. Experiment worked now onto a 2000 litre tank buried in a mix of wood chip from deciduous trees and farm yard manure, i.e. cow poo and straw. Will take your tips on critical mass and will get at least 2m of material around tank. I get to move my muck with a tractor and spreader but the compost will go straight out onto our pasture. Great to see other folks uncovering Pain’s work and experimenting. We are doing the same here in Vermont and would love to collaborate with others. 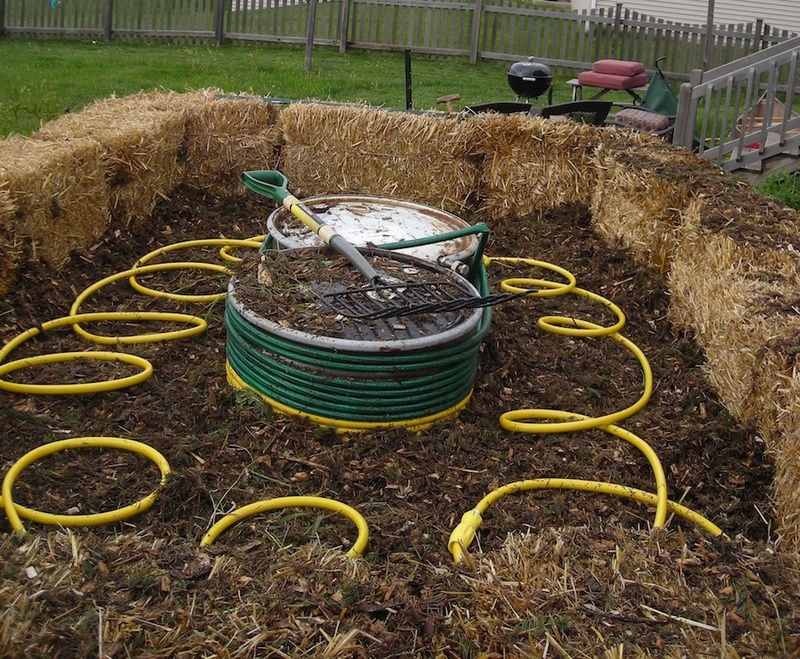 We have expertise in both thermal energy from compost systems and biodigesters. Please look me up if you have the time, it’d be great to hear more about your experience.